These soft, flexible, non-toxic Tempa-DOT™ Single-Use Clinical Thermometer are ideal for oral and axillary use. Designed for one-time use, these disposable thermometers accurately assess infant, pediatric and adult temperatures in 60 seconds, while also addressing the risk of patient cross-infection. Temperature in Fahrenheit. Hygienic. Easy to Use. Accurate. Reliable. My wife has trouble reading or trusting a regular / conventional thermometer. She trusts this one. It's worth the money! Reliable. Easy to Use. Hygienic. Accurate. We purchased these for our elementary school health clinic. They're perfect for kids of this age as they often have trouble with the heavy, under the tongue thermometers. And they're affordable, which is so important! Easy to Use. Accurate. Hygienic. Reliable. Good for teaching 1st year medical assisting students how to take temperatures. Easy to read, very hygenic and inexpensive. Hygienic. Easy to Use. Reliable. 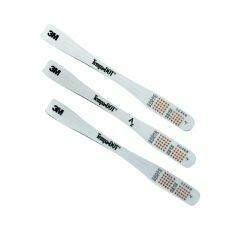 I've used the 3M Tempa-Dot product for years. It is the best method to check my kids temperature that I've found. Ear thermometers are inaccurate and digital thermometers make my kids gag, so they won't hold them in the correct position. The only problem I've had with this product is the last batch I purchased was defective and had to be returned. Otherwise, they are great and worth every penny!